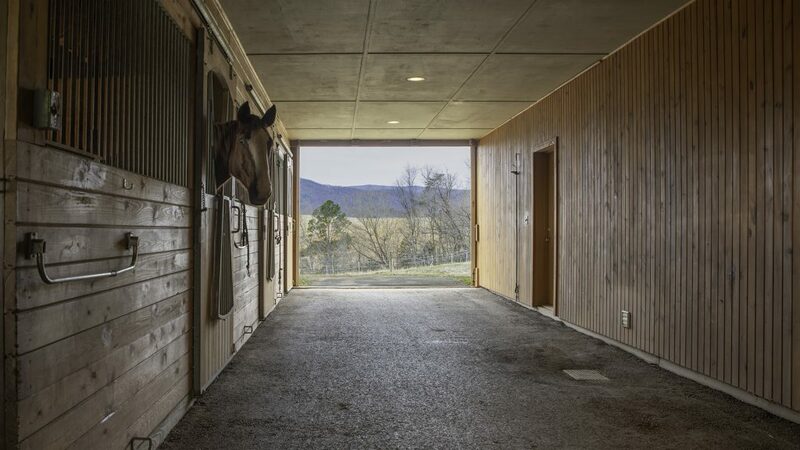 Everything you can imagine for your dream Virginia Horse Farm! 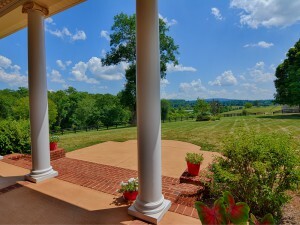 Visit the website for more details about this beautiful horse farm for sale in Madison County Virginia. Did you know that Virginia is one of the few caveat emptor (buyer beware) states in the country? Most buyers coming outside of the state expect to see a long list of disclosure items from the seller. For example: Dishwasher works, stove works, there is an easement across the property and so forth. 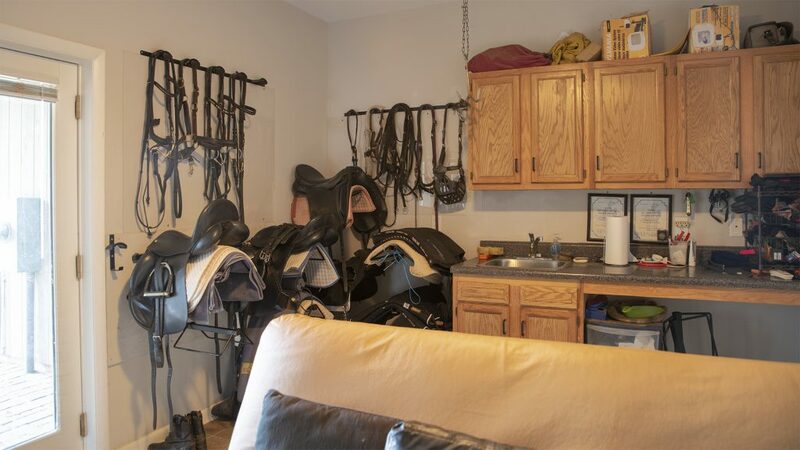 In Virginia, the seller has to tell you very little about the property. When you make an offer on a property, you will be given a Summary of Rights and a Residential Disclosure form to sign. You would be wise to read these documents and ask some questions about the property. Here are some of the items that the seller does not need to disclose. This list comes from the link off of the Residential Disclosure Form. The Seller makes no representations or warranties about the property, the improvements and if there are any covenants and restrictions. The Seller makes no representations pertaining to the adjacent parcels. That beautiful field across the street could become the next high-density development or the county dump and the Seller does not have to tell you. 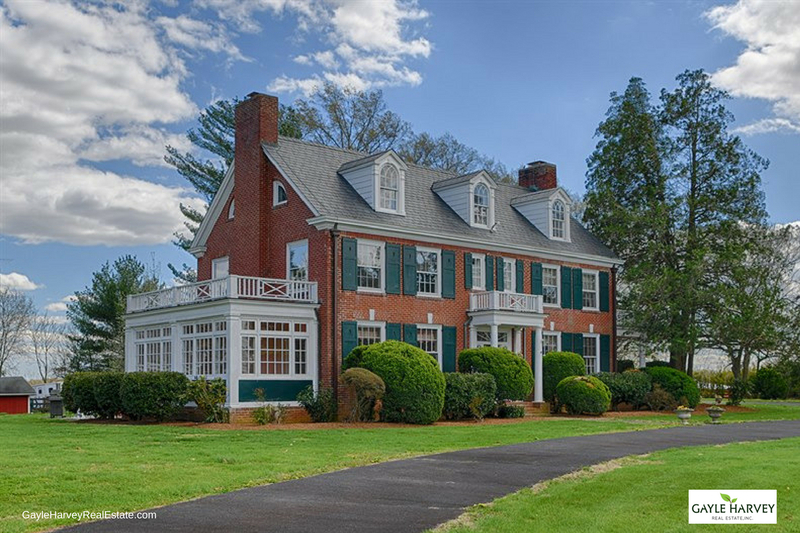 The Seller makes no representation as to whether the property is in a historic district and if you need to go before a board for approval prior to making any changes to the home or property. The Seller makes no representations as to if the property is in a resource protection area. The Seller makes no representation if there are any registered sexual offenders in the area. The Seller makes no representation as to whether the property is within a dam break inundation zone. The Seller makes no representation as to if there are any stormwater detention facilities n the property or if there are if there are any maintenance agreements on it. The Seller makes no representations about the wastewater system and if there are any regulations pertaining to it. The Seller makes no representation as to whether you can place solar panels on your home or property. The Seller makes no representation that the property is in a flood zone and if flood insurance is required. The Seller makes no representation that the property is or is not under a conservation easement or any other type of easement. The Seller makes no representation as to whether the property is subject to a community development authority. Most Sellers and their agents will do the proper thing and make you aware of potential problems. If the Seller’s agent is aware of a problem and it lies within the property boundaries, then the agent must disclose the problem. So, what does the Seller have to tell you? If there have been any mining operations on the property. If the property is located in a locality with a military installation. If the home has defective drywall. If the home has pending building code or zoning ordinance violations. If the property has been used to manufacture meth. Yes, like a Seller is going to really tell his agent this. Nevertheless, it is the law! If the property septic system has an operating permit that cannot be transferred. So, what is a buyer to do???? Do some research at the courthouse to find out about covenants and restrictions, easements, historic districts and adjacent parcels. Talk to your insurance agent about insuring the property. Get the well and septic permits, if they exist, from the county health department. Look at the county website for zoning permits and zoning districts. Look at the FEMA website for flood zones. It never hurts to ask lots of questions and to do your due diligence! 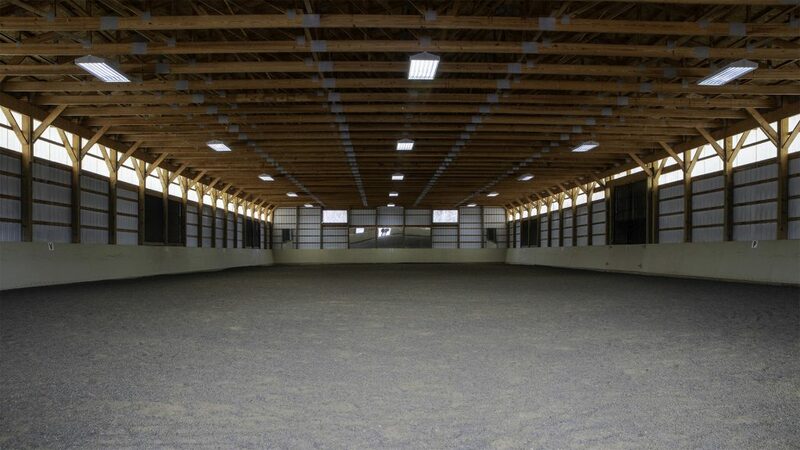 Looking for a horse farm in Virginia? 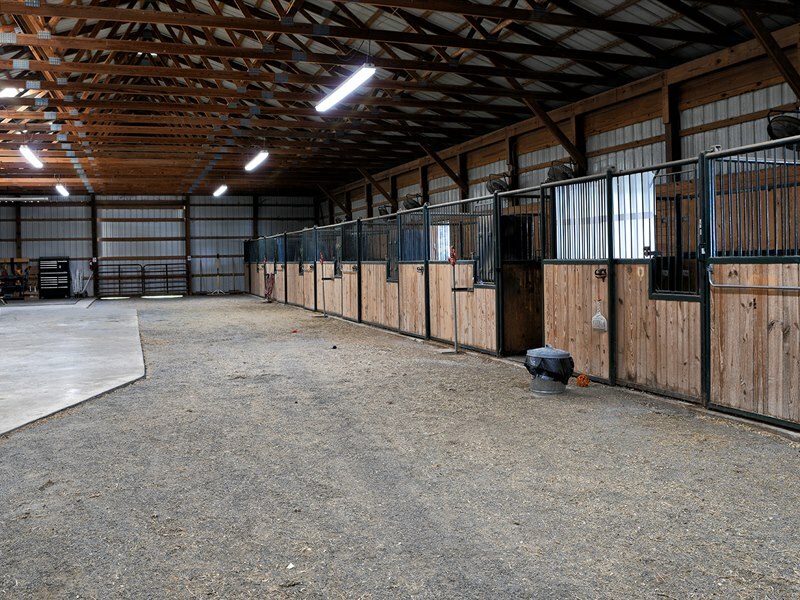 Red Horse Farm in Elkton, near Harrisonburg, has lots to offer the horse or small farm enthusiast. 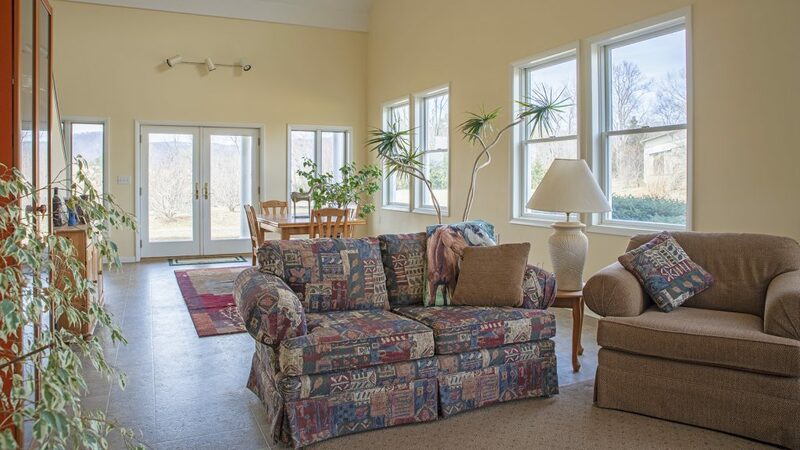 The beautiful and practical one-level home offers stunning mountain views looking out towards the Shenandoah National Park and Massanutten Ski Resort. 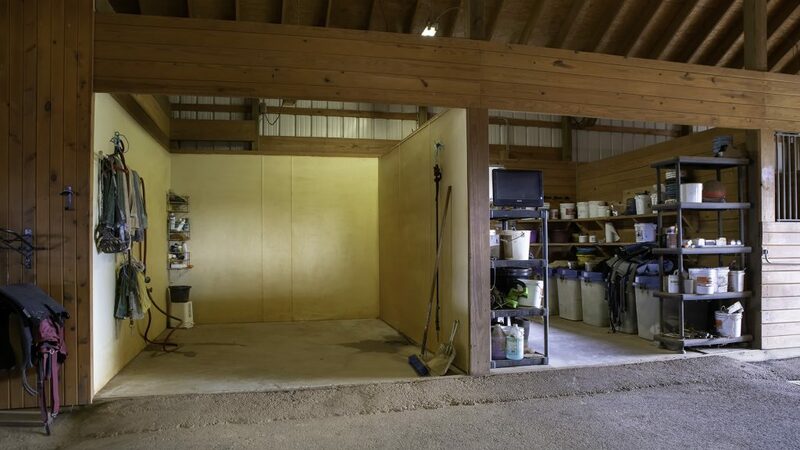 The large barn currently has eight stalls but could be expanded for more or remove them and have a fabulous workshop. 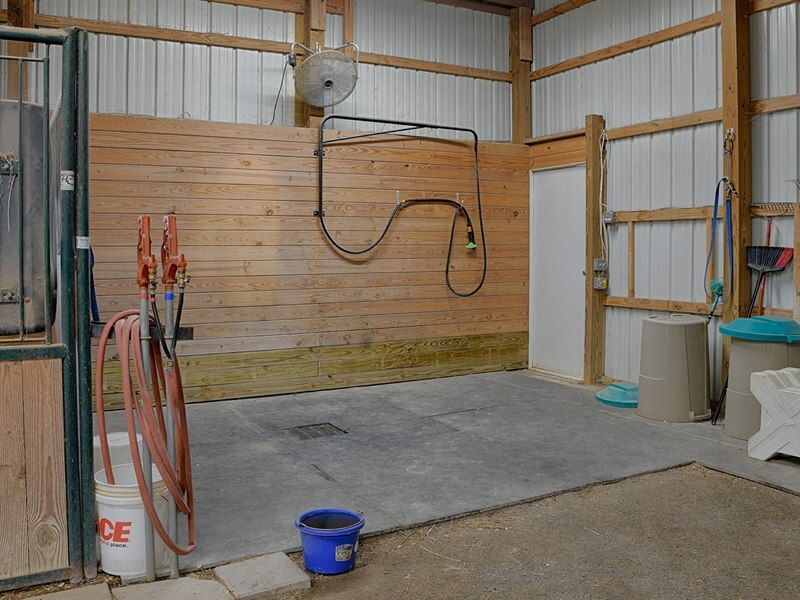 The Stable includes a wash stall with hot and cold water and a conditioned tack room. Going back to the house, there is a fabulous patio with built in grill. This is perfect for entertaining in the warmer months. The expansive kitchen has room for multiple chefs and a great island for the non-chefs to hang out. Notice the beautiful views out the windows. 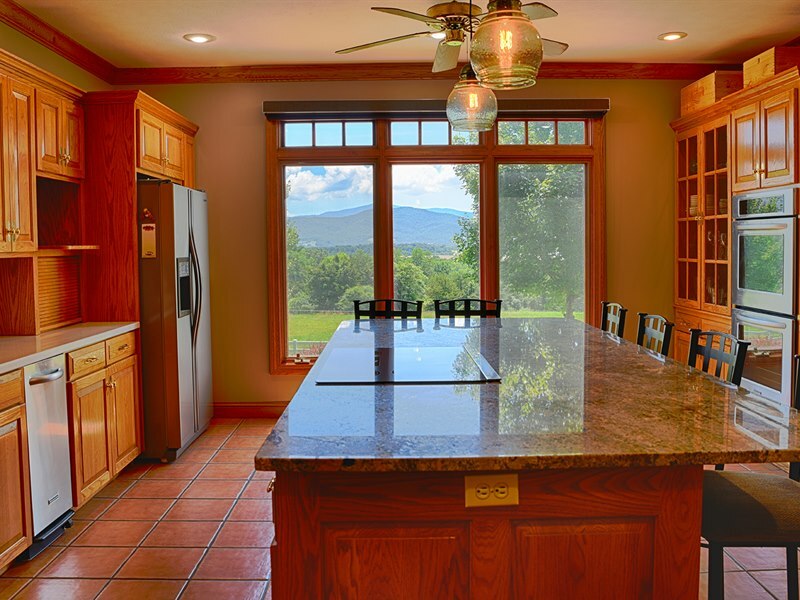 Chef’s Kitchen with amazing views of the mountains. Relax in the spacious den with fireplace. The three-bedroom home offers a split bedroom design with a large master bedroom suite that encompasses one end of the house. 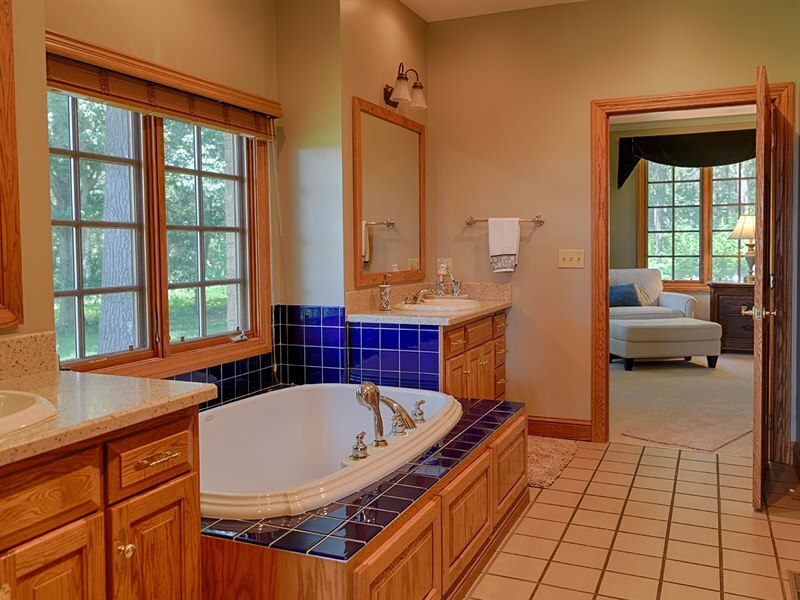 The large master bath offers an additional Jacuzzi Room. 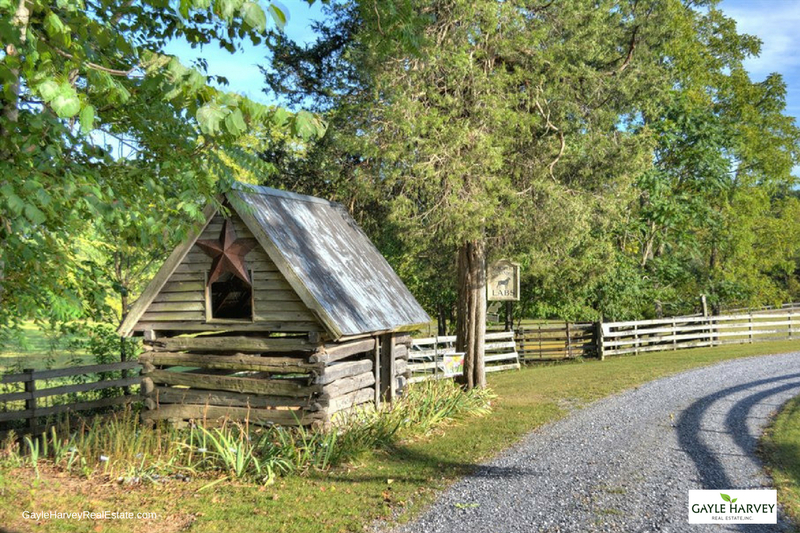 For more details about this spectacular small farm on 41+/- acres, click here. 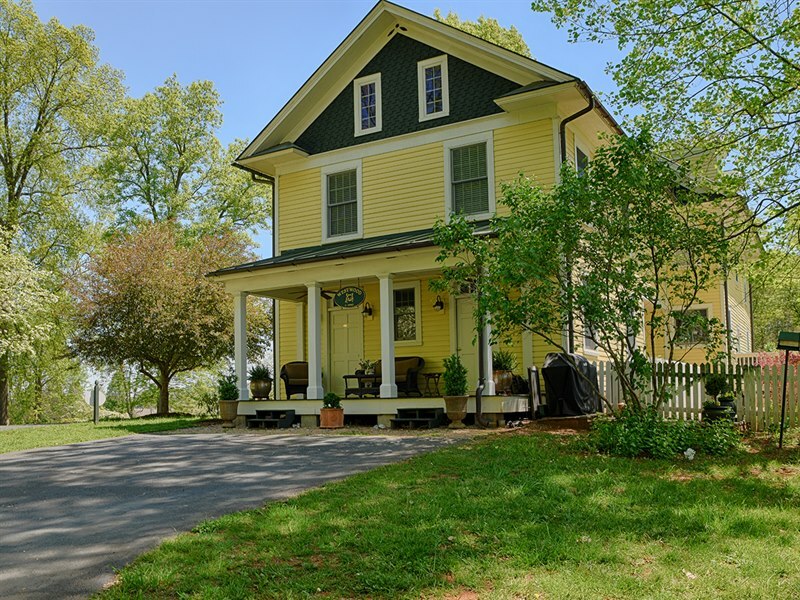 Just minutes from the town of Orange, you can find this Virginia Farmhouse for sale. Currently used as a Bed and Breakfast, this farmhouse combines classic old home charm with today’s modern home necessities. 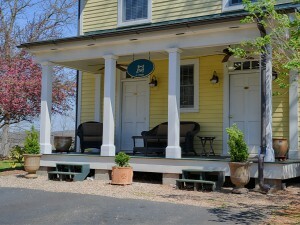 Below is one of the lovely farmhouse porches. 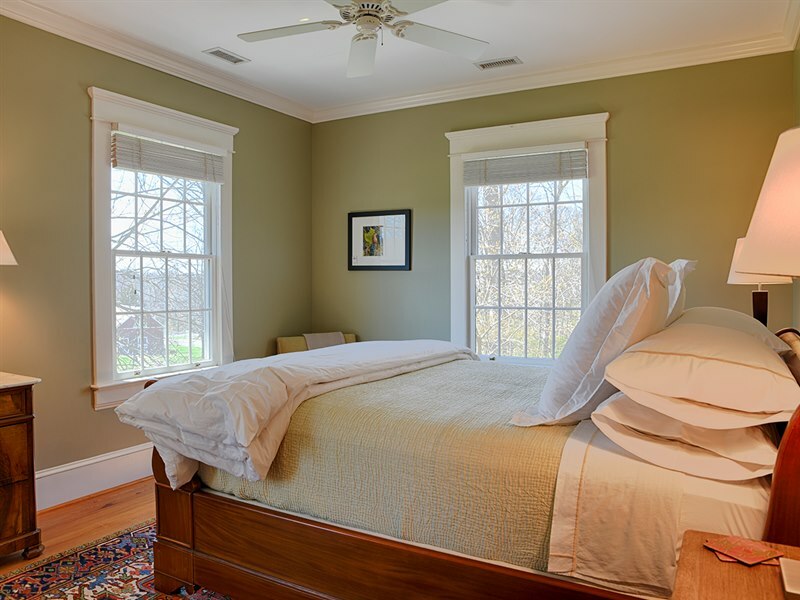 This one is off of the first floor master suite which could also serve as an office or for an Air BnB rental. 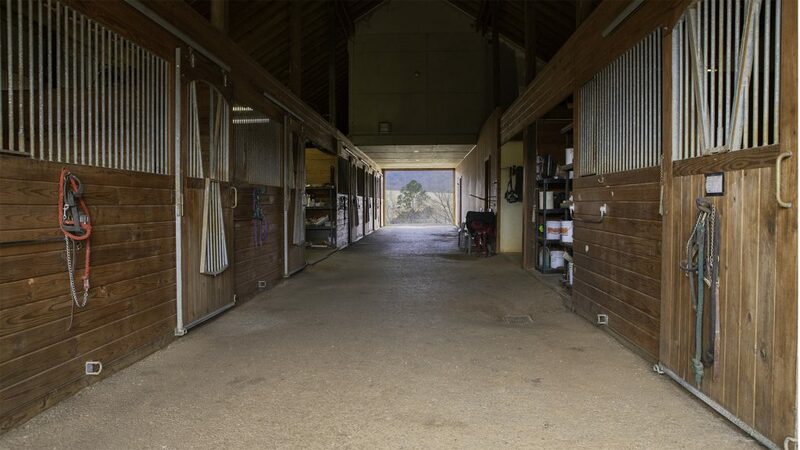 The classic barn is currently used as an event venue but is also suitable for most types of livestock. 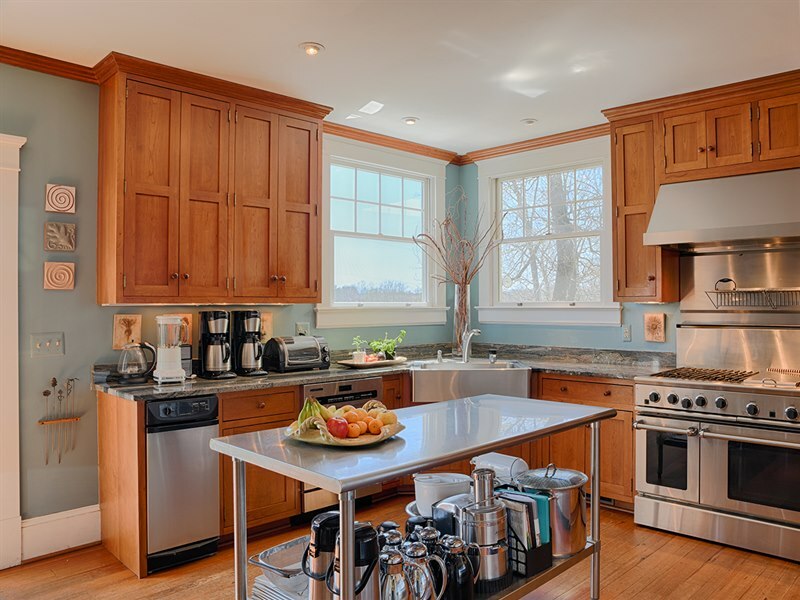 The wonderful kitchen is equipped for the home chef. 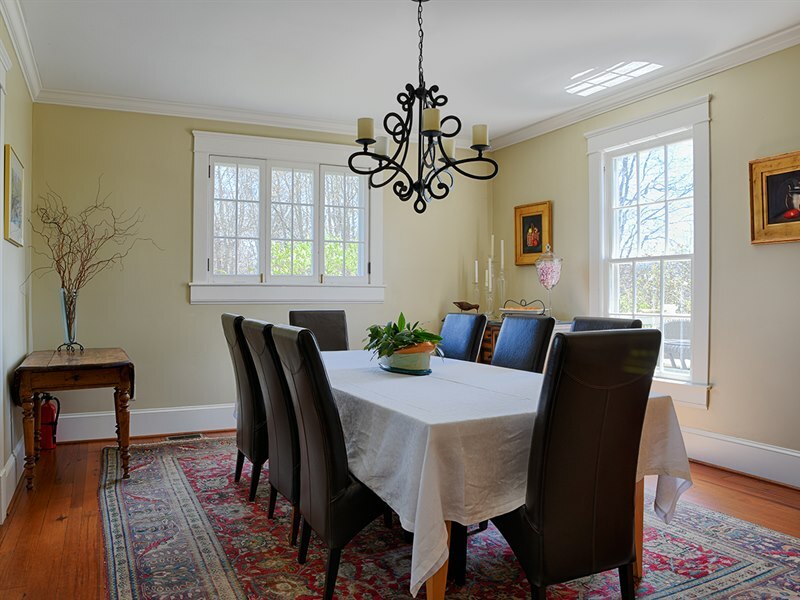 Enjoy serving meals in the lovely dining room. Four bedrooms are on the second level. Three are en suite. The rear of the home offers a large deck and patio area. 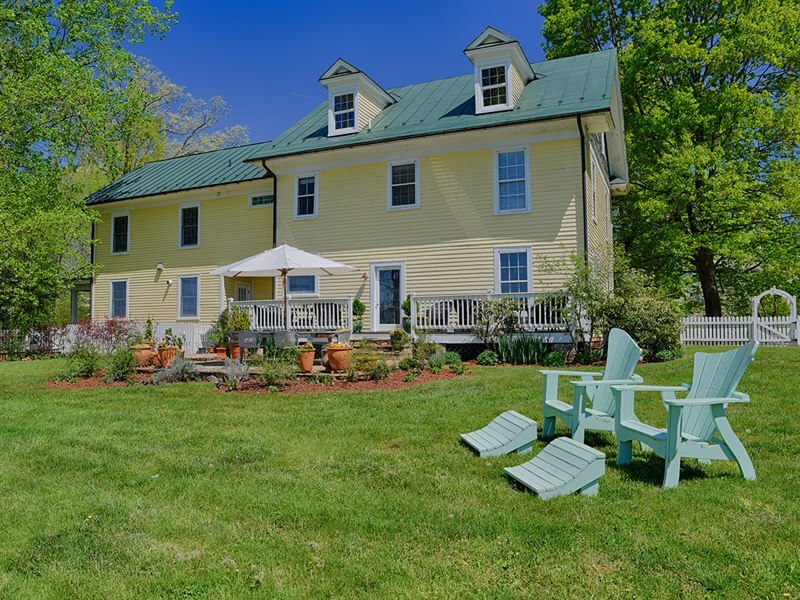 To learn more about this wonderful Virginia Farmhouse, click here. Or call Gayle Harvey Real Estate at 434-220-0256. 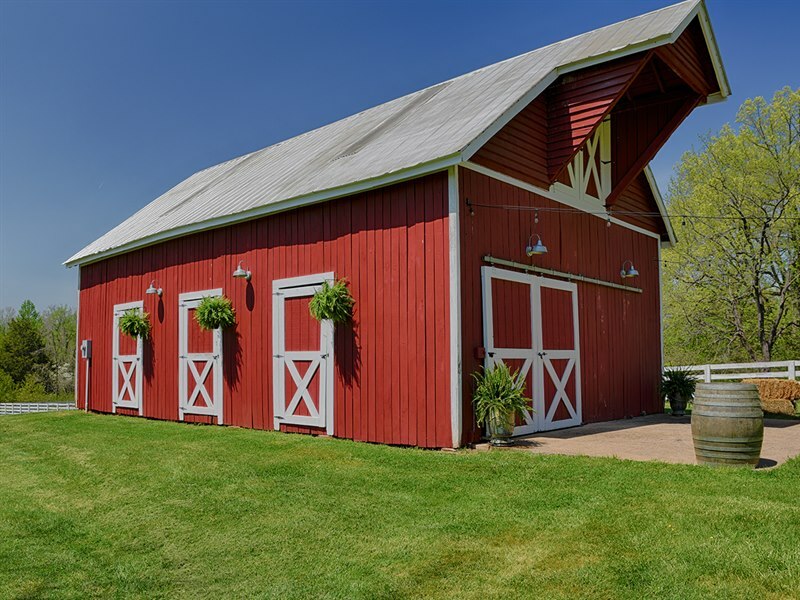 Are you thinking of selling your farm? 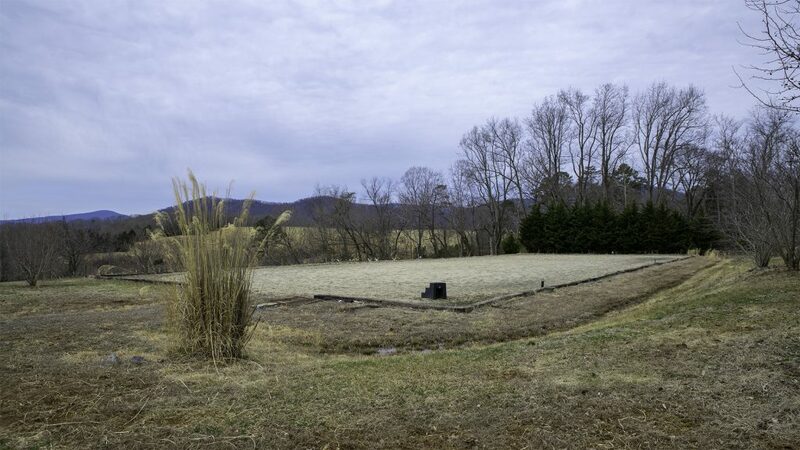 Putting your Charlottesville VA farm on the market is not as easy as sticking up a ‘for sale’ sign in front of your property. It can be a challenging process, both from a business and family perspective. Sometimes it can also be an emotional event, especially if the property has been in the family for generations. It isn’t just a house and some parcel of land. It’s an important part of your family’s life, filled with wonderful memories. However, there are circumstances when you have to part with it. Regardless of the motivation to sell your farm, it is important that both you and your property are prepared for the selling process. 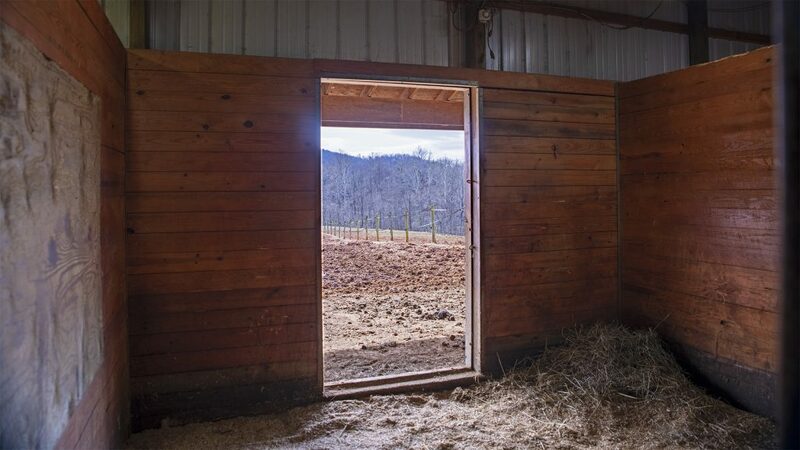 First impressions matter in life and selling a rural property is no exception. When you impress potential buyers viewing your property, you can expect a quick sale for a great price! 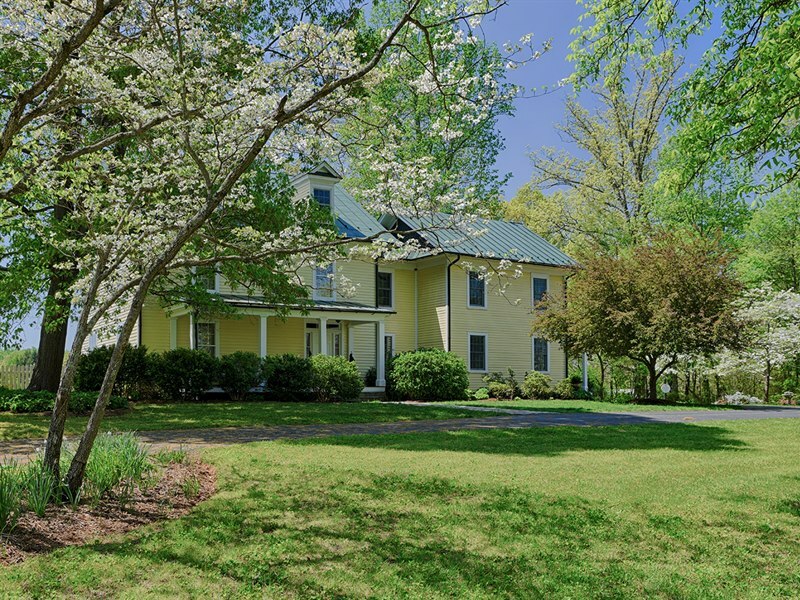 Many buyers are drawn to Charlottesville because of the lifestyle it offers. In fact, the city often finds itself at the top of the list of the best places to live in the U.S. Who wouldn’t be attracted to a community that captures the perfect blend of city meets country? 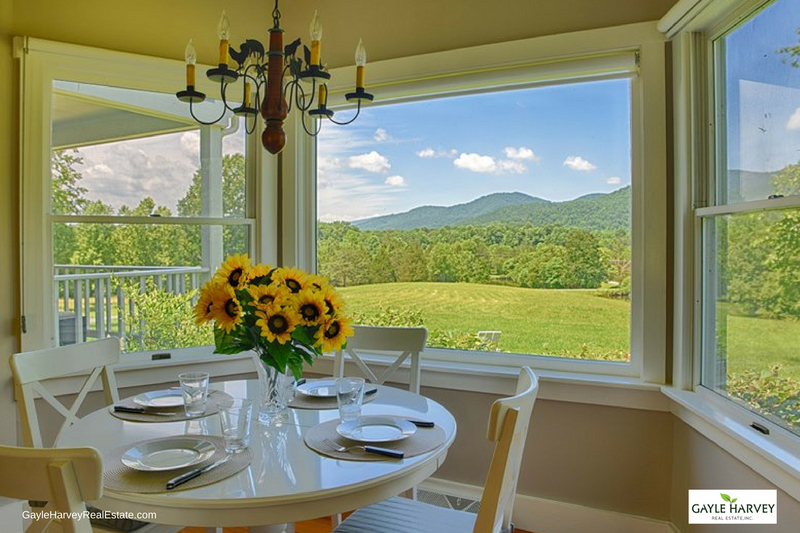 In addition, the area is renowned for its pastoral and beautiful farms located amidst the gorgeous backdrop of the eastern slopes of the Blue Ridge Mountains and the gently rolling hills of the central Piedmont. By doing the necessary preparations, you can create a positive impact on buyers and optimize the sale price of your property. This in turn can help you quickly move on to the next stage in life, be it retirement, reinvestment, or something else. 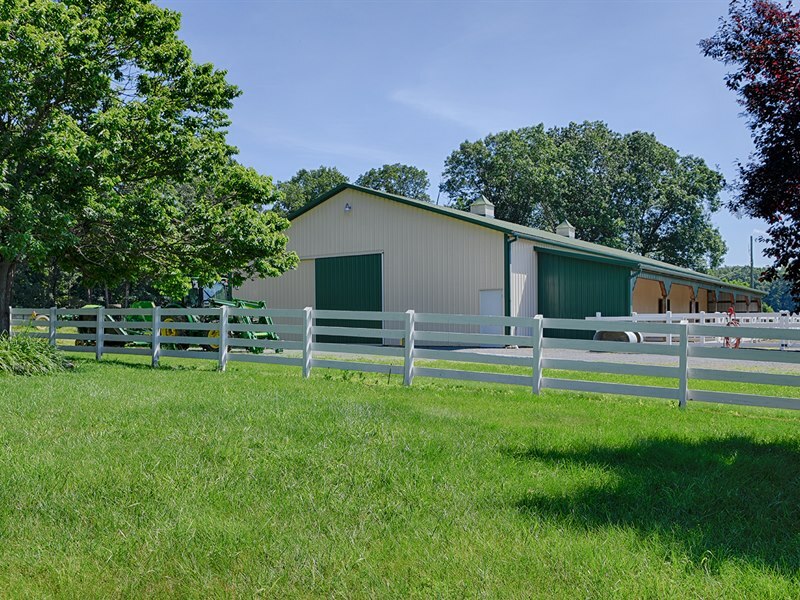 There are several different aspects you need to carefully consider prior to selling your property, whether it’s a commercial farm land, a grand Virginia estate, or a small hobby farm. Hi, I’m Gayle Harvey, your Charlottesville Virginia real estate agent and broker specializing in farms, land, and estates in the central Virginia region, I have been involved in the Charlottesville area real estate industry since 2001. I have more than 20 years of hands-on experience with horticulture, cattle and horses. I also hold the prestigious Accredited Land Consultant (ALC) designation. 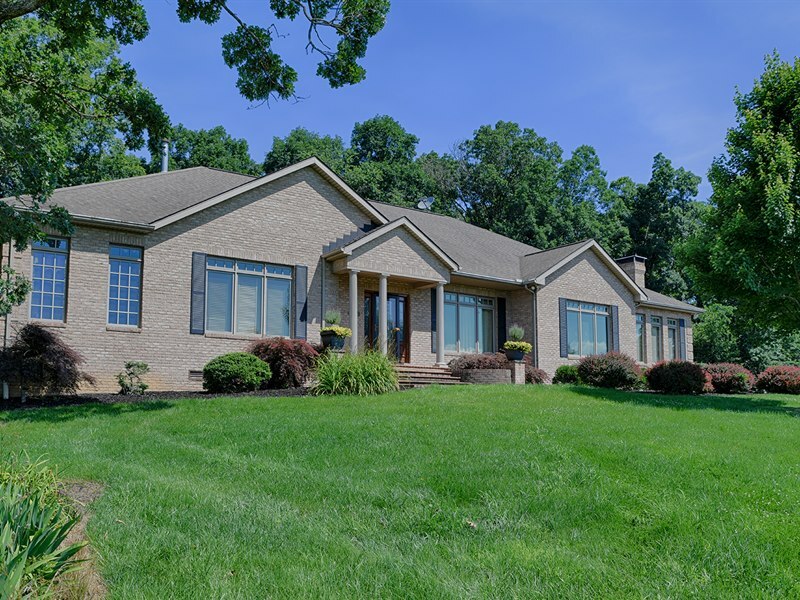 I help buyers and sellers throughout central Virginia achieve their real estate goals through my knowledge of the current local real estate inventory combined with information on past and recent past sales. 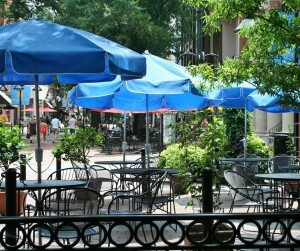 You can find out more about me by checking out https://www.gayleharveyrealestate.com/charlottesvillerealtors.php. I created this article to help you understand the importance of your home’s worth, how to determine your property’s value, and how to increase the value of your property so that you can focus on ensuring your farm can be marketed as an appealing package and greatly boost your chances of getting a good deal on the sale of your home. What is your VA farm worth? So much depends on the answer. Before we go any further, let us first define true market value. Basically, market value is what buyers are willing to pay for your property. It is the price that your home should sell for in the current market. Your property’s value will depend on several factors, including how it was built, its location, the condition it is in, and the size of both the house and the property it sits on. Hard as it may sound, it has nothing to do with how much you love your home, or how many special memories you’ve built there. It is critical to have an accurate idea of your property’s value before listing it for sale. One of the main reasons why a property fails to sell, or gets overlooked entirely, is that it has a listing price that is too high for either the home or the location. A property that is priced too high will not sell quickly and may ‘go stale’ in the market, while an underpriced property will not give you the best return on your investment. Pricing will also determine how quickly your property sells, how attractive your property will be to buyers, and how you will reach your financial goals regarding the transaction. How do you determine the value of your property? There are several methods that are used to determine how much a home is worth. There are homeowners who believe that the price per square foot method is an excellent way to determine a home’s market value. What they usually do is take the sale price of a home that is similar to their property and then divide the amount by the number of square feet in their home. However, the price per square foot method can be used as a measure to understand the general values of an area. But it should never be used to determine the market value of a home. This method is ineffective because every home is different. While properties may be similar in terms of square footage, number of bedrooms, number of bathrooms, and location, there are many factors that are not taken into account when using the price per square foot method. These include property features, upgrades, and amenities. 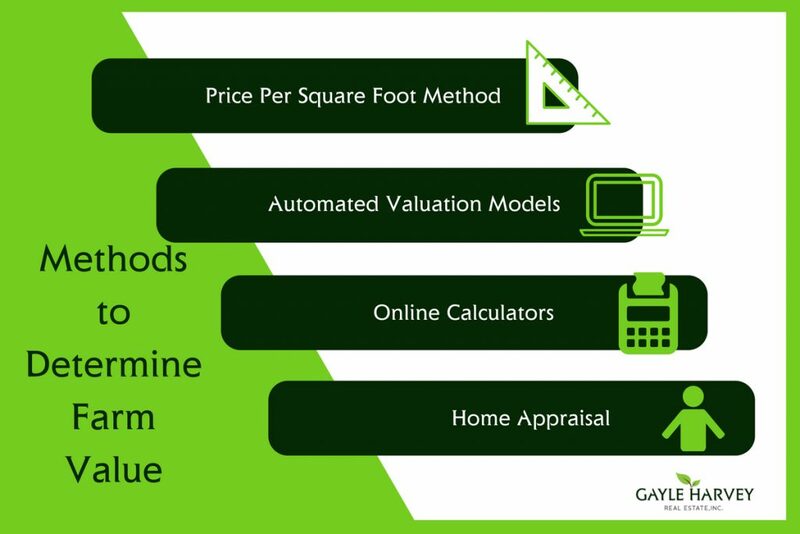 Automated Valuation Models or AVM’s can provide real estate property valuation. They use public records like property transfers, deeds of ownership and tax assessments along with some mathematical modeling. They try to predict your home’s value based on recent sales and listing prices in the area. AVM’s can be produced in a matter of seconds. They use statistics and lots of data. Sounds reliable, right? However, just like the price per square foot method, AVM’s don’t take into consideration property features, upgrades, and amenities. Another problem is the fact that the data can be delayed at times. If a database has not been updated for a few months, it affects the accuracy of the estimate, and that amount of data varies by municipality and sometimes by home. If you search “how much is my home worth”, the result will show a number of home value estimators. In fact, there are several websites that offer free market value estimations. The most popular ones are Zillow and Trulia. Many of these estimates generate automatically based on public information like tax records, sales history, and comparable sales. Within seconds, you will receive a figure based on recent sales and the site’s information about your home. But do sites like Zillow provide accurate home values? Not exactly. Some of Zillow’s Zestimates can be off by $30,000+. Why is this so? It’s because these websites have no clue on what is currently happening in your local real estate market or what the condition of your home is. One accurate method to determine the market value of your home is to hire a professional appraiser. The cost of an appraisal typically ranges between $250 – $500. However, it is a great way to get an unbiased opinion of your property’s market value. Let’s delve deeper into why online estimates aren’t as accurate as many people would like to believe. There are many tools available for the average person interested in selling a home. The internet provides numerous resources. However, not everything you see online is true. You must take it with a grain of salt. The facts in the public record or the MLS can be inaccurate. 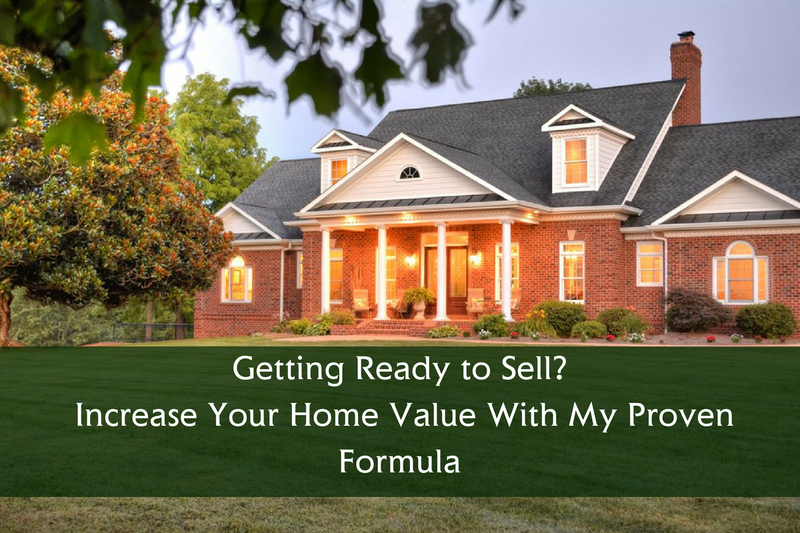 Since these estimates are generated automatically based on public information like tax records, sales history, and comparable sales, any discrepancy on the information will affect your home’s predicted value. If you live in a rural area, where sales are rare due to people staying in a home for a long period of time, the data can be even less accurate. Your home is not like others in your neighborhood. It’s difficult to arrive at an accurate value if there are no comparable homes. If your property is not like others in your area, or has unique features, there may be no comparable properties to compare it with. Few homes in your neighborhood may have sold in the last six months. Estimates are more accurate if there is a high housing turnover rate. The hotter the market, the more MLS data and sale prices the computers can use to calculate value. On the other hand, with few sales, there is less information to draw from. The real estate market may change rapidly. Home valuations are based on past sales. If the market is considerably hotter or colder than it was six months ago, those past sales are less reliable an indicator of current values. Upgrades and unique features are unaccounted for. You may make improvements to your property, and online value estimators have no way of knowing unless your local property tax assessor knows about your upgrades. If you make any updates that require permits from the city, that information may be passed along to the property tax authorities and entered into the public record, which is where online value estimators could learn about it. However, if you make improvements that didn’t require any major permits, these upgrades may be unaccounted for when you try to get online valuation. So even if your home has a brand new designer kitchen, and a similar neighbor’s property has an outdated one, online estimates value both homes similarly even though your home may fetch a higher sale price. You need to have a clear understanding of your property’s value. To help you, I can provide you with a free evaluation of your property that will give you an accurate estimate of its current value in today’s real estate market and ultimately what you can expect to sell for. Let me share with you top reasons why using a real estate agent to assess your home value is a smart move. A real estate agent goes beyond the hard, basic data, like the square footage and the number of bedrooms, to assess your home. As an agent, I look at homes through the buyers’ eyes, allowing me to envision how the home needs to be positioned against other similar properties for sale. I can provide you with both an assessed value and a market value (the value your house will most likely be sold for in an open market). On the other hand, an online calculator will only give you an estimated assessed value, which is sometimes based on wrong or outdated data. As a real estate agent, I can assess the specific details of your property, both positive and negative. I understand how important it is to price your home right. You don’t want your house sitting on the market for too long, nor do you want to undervalue the price of your home. How Do Real Estate Agents Value Your Home? It takes an experienced real estate agent who understands the nuances of the market, and the specifics of a home to provide an accurate market value. So how do real estate agents, just like myself, arrive at a price that not only realistically reflects just what the property is worth, but also maximizes what the seller can achieve for it? One of the best ways to determine the value of your home is by having a comparative market analysis (CMA) performed on your property. What is a CMA? A CMA is a detailed analysis performed by a real estate professional that analyzes recently sold homes (“comparables”) within the past 6-month period in a specified area. Sales more than six months in the past are not good comps, especially in fast-moving markets. The very best situation is that the property is in the same subdivision. However, that’s not possible most of the time, so the next consideration is locating comps in the same neighborhood or general area. When it comes to the style of residence, the number of bedroom and baths, the square footage of the home, the size of the lot, and other features of the property, the comparable homes should be as similar as possible. 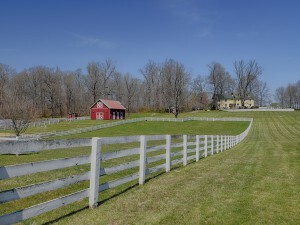 How do you increase the value of your Charlottesville VA farm? One simple way to increase the value of your property is to make sure it is well-maintained. When selling a property, first impressions really do count. 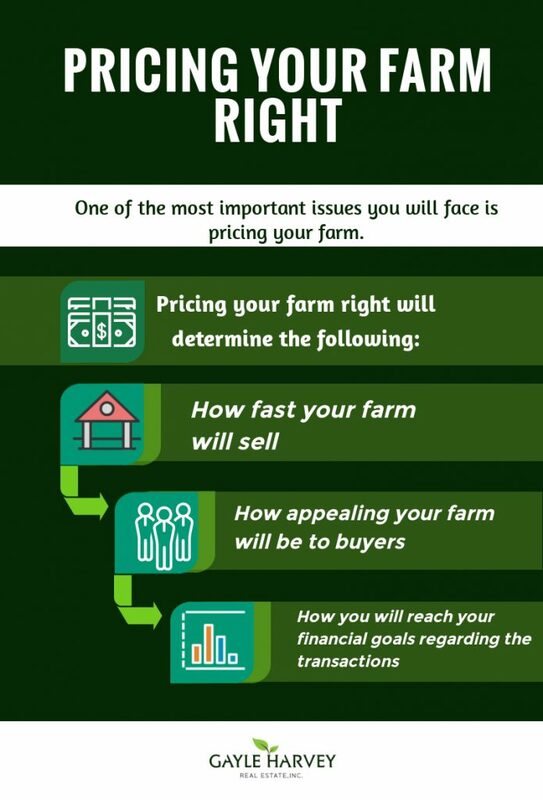 Within the first minute of visiting your farm, the prospective buyer will have formed 80% of their overall opinion about your property. One of the biggest mistake property sellers make is thinking that, because it’s a farm, the buyers won’t care what it looks like. This couldn’t be any further from the truth. Lack of presentation from the seller’s side will surely drive buyers away. Imagine this: you’ve seen a property on the Internet and liked the pictures and price, so you arrange a visit in person. However, once you alight from your car, you’re greeted by a broken gate, a pile of dishes in the sink, a dirty carpet, and the smell of wet dog. Will you remain enthusiastic about the property? Certainly not! So clean up. Put your personal items away. Have the carpets cleaned and touch up the paint. Make sure that when buyers come, they will leave feeling like they could see themselves living in your home. 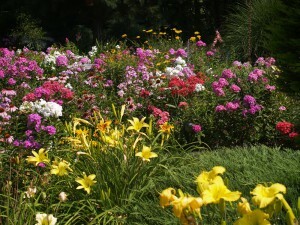 Landscaping is a win–win proposition. Not only does it increase property value, it is also great for the environment and has been shown to improve your health! Before doing anything, make sure that you have a master plan. Pay special attention to the curb appeal. When potential buyers arrive at your property, the overall effect should be a welcoming feast for the eyes. Adding a fence can also greatly enhance your landscaping. Putting up fences outline special areas. For example, you can consider putting up a decorative fence between the yard and pasture. Another strategy that can boost your property’s value is to show evidences of your farm’s success. Buyers love to see that someone has had success on this property, and it makes them feel like maybe they could find success here too. 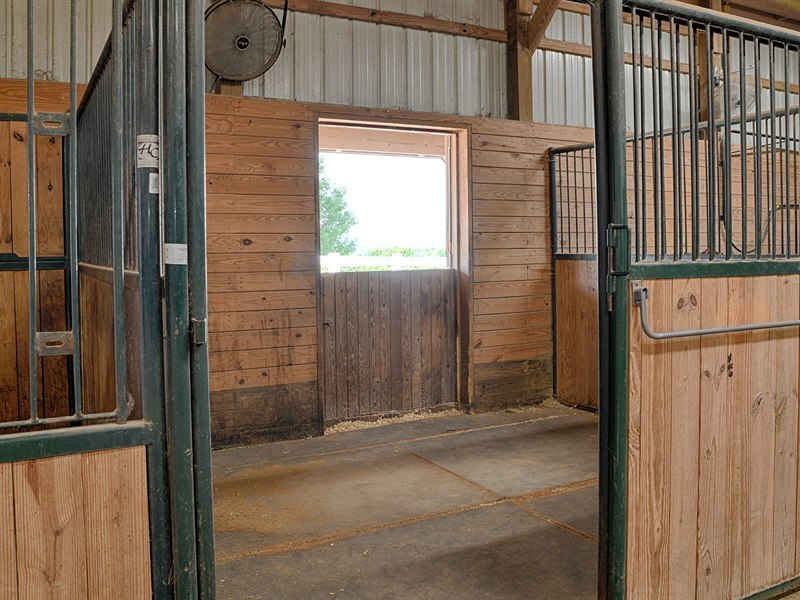 Are you selling an equestrian farm? Have you won ribbons or trophies in horse showing? Display them in the barn aisle or in your office space in the house. Can you provide verifiable stats on your farm’s production for the past 12 months? This way prospective buyers will immediately feel at ease when considering a purchase. Keep in mind that potential income generation is one of the biggest objections a buyer can have with a farm. You can take that off of the table by proving your property’s previous successes. Another popular way to increase your property’s value is home staging. This involves arranging and decorating the property in a way that appeals to a wide range of buyers. 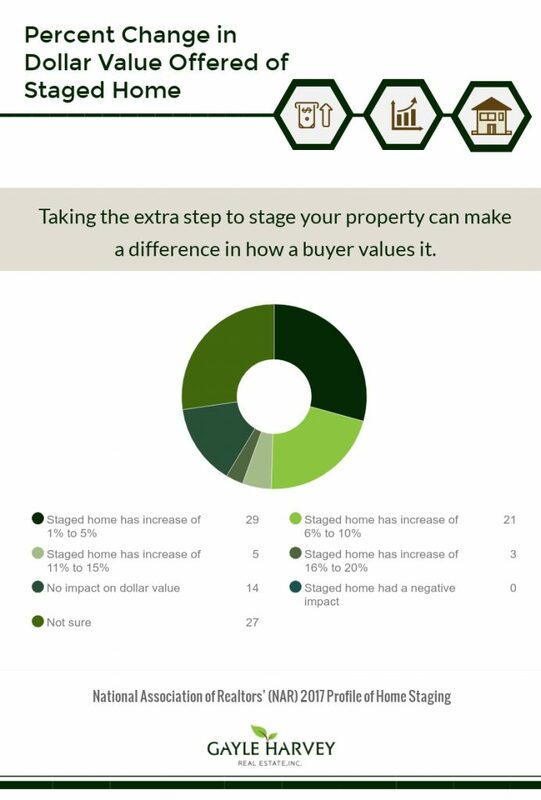 Taking the extra step to stage your property can make a difference in how a buyer values it and the price you might get for it. According to National Association of Realtors’ (NAR) 2017 Profile of Home Staging, 29 percent of sellers’ agents reported an increase of one percent to five percent of the dollar value offered by buyers, in comparison to similar homes. Twenty-one percent of respondents stated that staging a home increased the dollar value of the home between 6 and 10 percent. It is also worth noting that none of the respondents reported that staging a home had a negative impact on the home’s dollar value. Is it difficult to access your property? Did you know that poor access can be the single greatest detriment to enjoying a property? A farm can be difficult to sell if it has no access. It will also diminish the value of your property significantly. No buyer will be willing to pay a premium rate for property with difficult access or no access at all. On the other hand, having good access can give you freedom to enjoy your property. In addition, good access can be pointed out to the buyer when the property is placed on the market. There are many different ways to determine the market value of a home. Make sure that you do not fall for the poor methods of determining market values. If you have any questions about farms, estates or the local real estate market, I would be glad to answer them for you. Call me, Gayle Harvey, at 434-220-0256 For a No Cost No Obligation (CMA) comparable market analysis of your property! Let’s work together to make sure that your home selling experience goes as smoothly as possible. 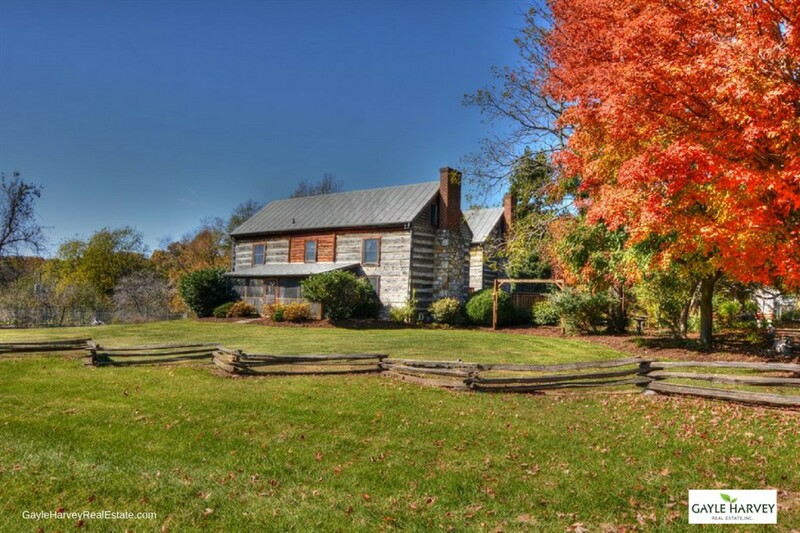 Allow my skills and experience to work for you as you sell your Charlottesville VA farm. Now that spring is upon us and summer is on the way, what better way to enjoy these seasons than by basking in the natural world? Whether you seek a solo retreat or a place to share with friends and loved ones, several of our listings offer gorgeous outdoor spaces in which to unwind, play, and/or entertain. 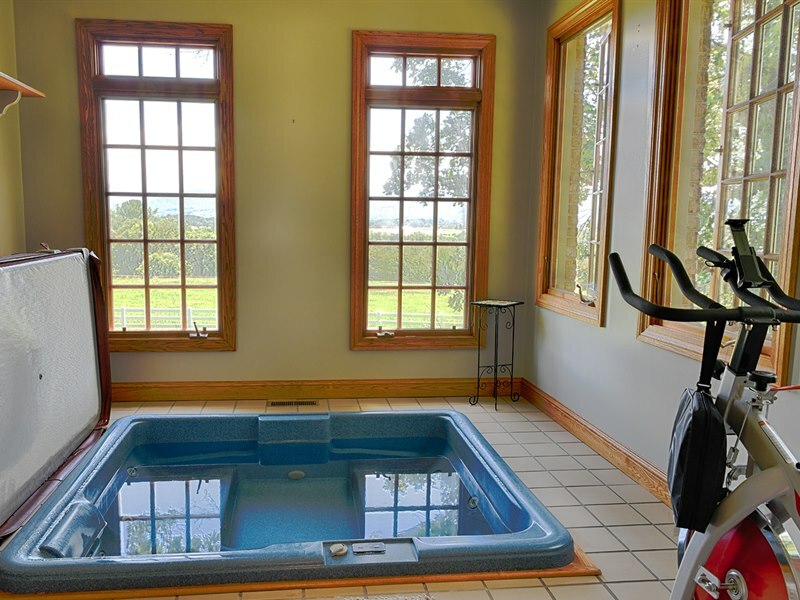 Dip your toes in the pool while enjoying mountain and Rockfish River views in Nelson County. Take your meals outside on the long deck surrounded by lush leaves and you’ll feel as though you live in a treehouse. 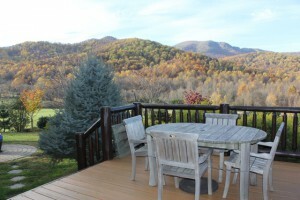 Admire the curved mountain peaks while you put your feet up on the rustic, log porch that seamlessly aligns with the style of this Madison County home. The rear porch at High Point Farm in Orange County provides ample room for comfortable seating on which to pass your time leisurely. During the day you’ll enjoy the sight of green pastures for miles and at night the seeming proximity of the stars unobscured by city lights. Sip your morning tea or coffee on the charming patio of this Orange County home. 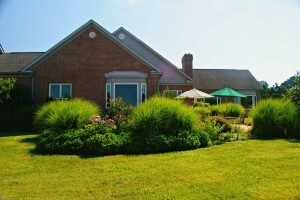 Here, you are surrounded by a mature garden that allows for privacy on your 6+/- acres as you reflect on the day ahead. 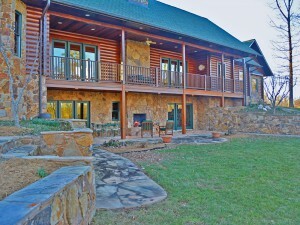 At the rear of this elegant cypress log home in Louisa County, relax on the stone terrace while you listen to the tumbling current of the North Anna River. On cooler evenings, enjoy the warmth of the fire in the exterior fireplace or make S’mores with friends. 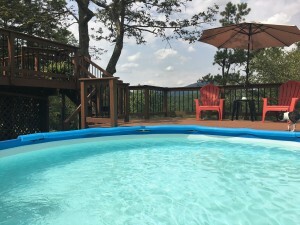 Just down the road from Charlottesville, this private paradise offers an infinity pool, wide terrace-level deck with room for lounge chairs and umbrellas, a long upper deck, and a screen porch with treetop views, all overlooking a pond with a dock. This historic Orange County estate includes a rustic barn reimagined as an event space. Enjoy open-air evenings with friends gathering for food and music. Or for quiet afternoons, read on the wide side porch with ceiling fans to cool you in the summer heat. 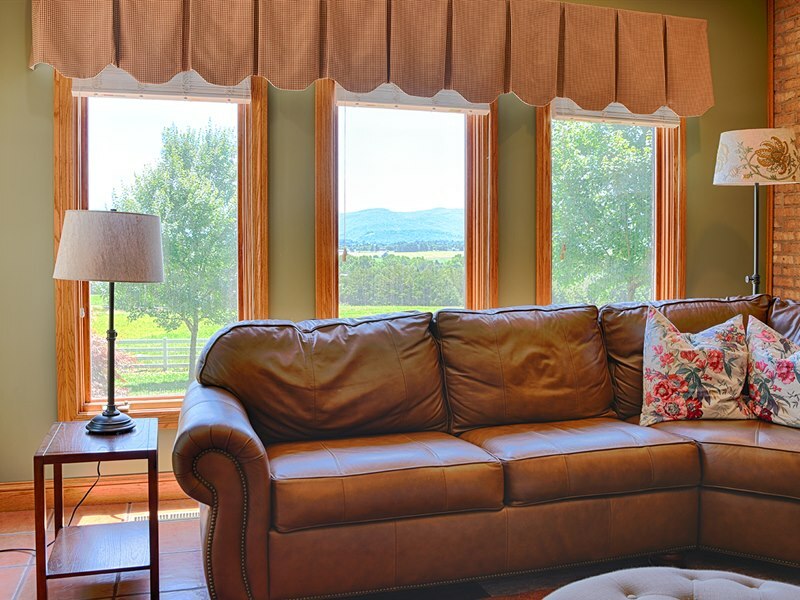 In the early mornings, awaken your senses with the sight of breathtaking mountain views from the back patio of this Madison County farm, or entertain guests for an evening party. On bright mid-afternoons, enjoy the shade of the distinct, semicircular front porch with its slate tile floor. 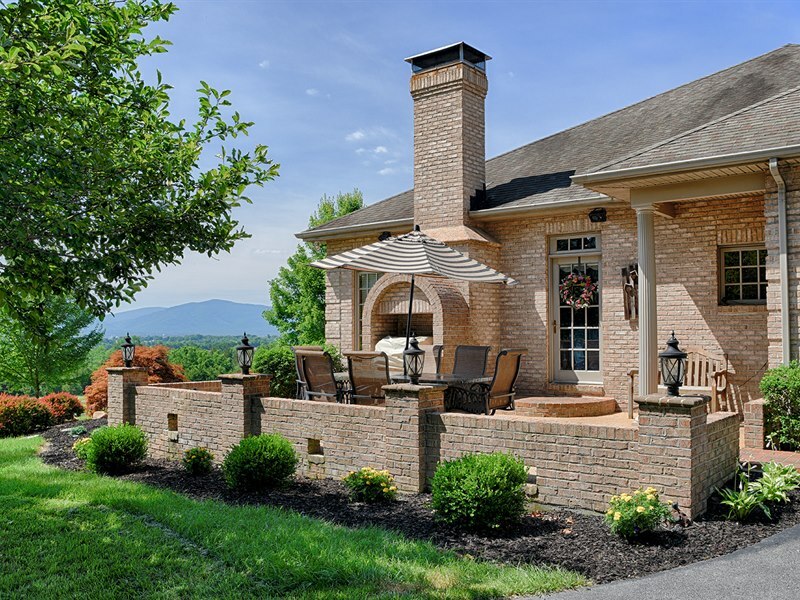 With so many beautiful central Virginia homes to choose from, let us know how we can help find the one that’s right for you! After a fickle, false start to spring, it appears the season might be here to stay. That means lots of outdoor activities in central Virginia for the enjoyment of all. From shopping for local foods and wares to spinning on a carnival ride, from relaxing on the grass while listening to live music downtown to hiking up a steep incline to get a breathtaking mountain view—the central Virginia area offers plenty of festive activities to celebrate the arrival of spring and the end of a long winter. This annual festival that honors both the official state tree and flower encompasses many community activities that span from March to May. One of these is the Dogwood Carnival (April 5-22) that takes place in McIntire Park. There are rides, games, and all the greasy food you can stomach. 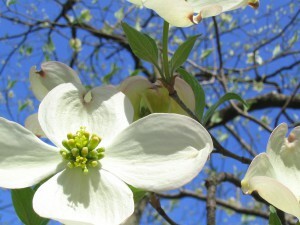 There is also the Dogwood Parade (April 21), in which participants will march along the pedestrian mall and loop down High Street. This year’s theme is “Candy Land” so bring your sweet tooth! 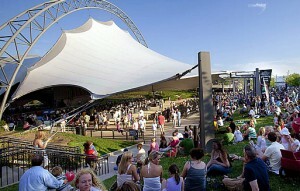 Unwind on a sunny afternoon with free live music at the Sprint Pavilion. Spread a blanket on the grass and enjoy a beer and other concessions offerings, the proceeds of which go to support local nonprofits. The music ranges from pop, hip-hop, rock, reggae, bluegrass, and folk, all played by talented local and regional musicians. You know spring is here when the city market returns to the lot between South and Water streets! Be on the lookout for fresh produce, homemade cheese, butter, and baked goods, handcrafted jewelry, woodwork, and ceramics, and delectable breakfast & lunch items so you can nosh while you shop – including fresh tacos, dumplings, bagels, and breakfast sandwiches hot off the griddle. This special tour highlighting beautifully designed gardens spans the entire state of Virginia, giving the public access to historic estates and homes. This year’s Historic Garden Week in the Charlottesville-Albemarle Area will provide tours of Morven Estate (land once purchased by Thomas Jefferson as a gift for Col. William Short), Castle Hill (a Georgian home originally constructed in 1764), Grace Episcopal Church, Chopping Bottom Farm (a Keswick estate with contemporary style), East Belmont (an early 19th-century home with formal garden), Ben-Coolyn (a 145-acre estate on land originally part of the Meriwether Land Grant of 1730), and the University of Virginia (specifically the Pavilion and Serpentine Gardens). National Park Week means there will be lots of things happening at nearby Shenandoah National Park to celebrate this natural resource. Entrance fees will be waived at all national parks on April 21. And on Earth Day, April 22, SNP will offer a ranger-led hike on the Appalachian Trail. Earlier this month (January 2018), National Geographic Traveler ranked Charlottesville among the top 30 Best Small Cities in the U.S., as well as giving it the distinction of “Most Literate” among its peer cities. To determine the rankings, National Geographic teamed up with Resonance Consultancy, a branding consulting firm that has created an algorithm for ranking cities and is behind the World’s Best Cities program. For the Best Small Cities rankings, the collaborative team analyzed social media references to cities in the U.S. and then organized them according to population size. Certain themes arose around certain cities, such as the number of coffee shops or art galleries, or—in the case of Charlottesville—the number of bookstores and college degrees. From those larger themes the team created superlatives to describe each city, rightly naming Charlottesville “Most Literate.” To learn more about our literary city, read our blog post on local bookstores. And, for all those eager readers out there, be sure to mark the dates of the upcoming Virginia Festival of the Book: March 21-25, 2018. To read the complete list of Best Small Cities in the U.S., visit National Geographic here.